Play in the Deep End of InterPlay! Hang out with the folks who are playing in the deep end of the InterPlay pool! Join us for time to create, play, laugh, lounge, eat, connect and learn. Find out who is playing in other parts of the country and the world. Learn new tricks. Share some of your own. Help us envision the next twenty or thirty or hundred years of InterPlay! We will gather at The Summit at Haw River State Park, Brown Summit, North Carolina (near Greensboro) a residential environmental education center located near the headwaters of the Haw River on nearly 300 acres of piedmont forest, fields, wetlands, and uplands. Crave some swimming in an outdoor pool or some 9 hole disc golf? Yes, that’s there too! The Body Wisdom Board of Directors will be meeting just before in Raleigh, July 24-26, beginning with dinner on Tuesday, continuing through Thursday morning. The Piedmont Triad Airport is 30 miles from the retreat center. Airport Shuttles serve the retreat center. It is situated between the cities of Greensboro, Winston-Salem and High Point. Local transportation will be coordinated. Details will be supplied to registrants. You can arrive anytime on the beginning day of the event. If you want to arrange an additional night of lodging either at the beginning or the end of the event you can contact Tammie Vass directly at the retreat center 336-342-6163/ tammie.vass@ncmailnet. Lunch on Monday should be over by 1:00 pm if you need to plan your transportation accordingly. Special discount! Register before June 8 and get $75 off! Nonrefundable $100 deposit or first monthly installment required to register. Payment plans available 6 monthly payments (under $105) or 8 payments (under $80) by credit card. A 5% processing fee is included. A payment plan must begin no later than the month of May. Cost: Register early and save! Check out cost details above. Summit Conference Center is located on 200 wooded acres just 15 minutes north of Greensboro an 25 minutes from the Piedmont Triad International Airport. 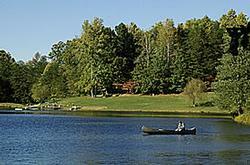 The main lodge overlooks a six-acres spring-fed lake and there are 5 miles of hiking trails. A boardwalk takes you through the Haw Rivers wetlands, giving you a close encounter with one of North Carolina's most unique ecosystems. Housing options include motel-style rooms for two with private bathroom and dorm housing with shared baths.